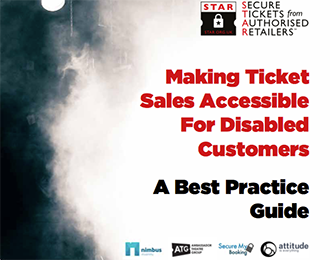 STAR (the Society of Ticketing Agents and Retailers) has today announced the publication of the first ever Guide on accessible ticketing for the UK industry. 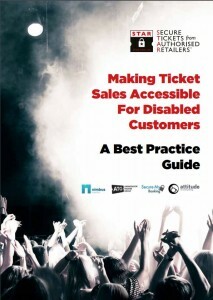 The “Best Practice Guide – Making Ticket Sales Accessible For Disabled Customers” was specially commissioned by STAR and written by Nimbus Disability Consultancy with contributions from Attitude is Everything. The Guide has been created to better serve Deaf and disabled customers, highlighting both legal and operational considerations around ticketing. In 2014, the charity Attitude is Everything published its State of Access report which found that 83% of disabled gig-goers surveyed had been put off buying tickets due to in inaccessible booking systems. 88% had felt discriminated against during the ticket-buying process and 47% had considered legal action as a result. 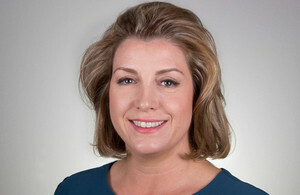 The Department of Work and Pensions show that UK households with a disabled person have a combined income of £249 billion after housing costs. By not offering complete online booking options to Deaf and disabled customers, the report demonstrated how the UK music industry was potentially losing out on £66m in annual revenue, or 2.5 million ticket sales. The Guide examines and explains all the key elements regarding accessibility for Deaf and disabled customers when purchasing tickets for live music events online, over the phone or in person at the box office. It explains the legal responsibilities of ticket sellers and venues as laid out in the 2010 Equality Act, whilst also providing guidance from the 2016 Equality and Human Rights Commission. The Guide continues by examining how best to handle the potentially sensitive issues around the role of Essential Companions, explains who and what they are, and the various accepted means of evidencing disability. This STAR Best Practice Guide has been made possible through funding from the Ambassador Theatre Group and JM Marketing, operators of Securemybooking.com. “Its a privilege to write a guide such as this and also introduce the concept of our Access Card scheme to a wider audience. The main point of the report is that making ticketing more inclusive is possible and that suppliers that put in a little time and effort will see the benefits.